At the center of today’s “Three Amigos” Summit in New Orleans between George W. Bush and his homologues, Mexico’s Felipe Calderon and Stephen Harper of Canada, is the sovereignty-swallowing nexus between trade, migration and military policy. As mentioned in this AP piece, Bush and Calderon held bilateral talks today in which they discussed NAFTA, the proposed free trade agreement (FTA) with Colombia and regional security. Much of the chatter in the press focused on how Calderon and Bush “defended” NAFTA and free trade. Lacking in all of the coverage of this and other regional summits is any notion of the symbiotic relationship between trade and militarization throughout hemisphere, including the U.S.. None of the press, for example, makes the connection between how economy-integrating trade policies like NAFTA or the proposed U.S.-Colombia FTA are inevitably accompanied by increases in the domestic policing and military budgets of the U.S. and its “Latin American trade partners” like Colombia, home to the worst human rights record in the Americas thanks to the more than $4 billion in military aid it receives from the U.S.
As they continue negotiating an exponential increase in the military aid Mexico receives from the U.S., Bush and Calderon appear to be plotting a Colombianization (drug wars, counterinsurgency wars combined with free trade) just a stones throw from our southern border. Nothing was said in today’s summit coverage about how Calderon and Bush are actually “defending” free trade with real guns and real troops.This link between increased free trade and mushrooming military budgets makes sense when we consider that border-smashing corporate interests represented by Bush and Calderon need uniformed people with guns to quash social tensions (formerly known as class conflicts) exacerbated by economic restructuring. Put another way, when the soft power middle class cushion between rich and poor gets tattered beyond repair by free trade, it is replaced by the hard power military cushion in both the U.S and Mexico. Following the same free trade+militarism=freedom formula, Bush and Calderon continued their plans to implement “Plan Merida”. Better known as “Plan Mexico”, Bush and Calderon’s plan is a “security” agreement designed deal with the “threat to our societies by drug trafficking and other criminal organizations operating on both sides of our common border. According to the Times Picayune, Bush told Calderon “I want to work with you in close coordination to defeat these drug traffickers”. After agreeing with Bush, Calderon added, “Recently, NAFTA has come under criticism, and I don’t believe people are realizing the benefits it has brought to the United States and Mexico”. As I’ve stated here and elsewhere, such “benefits” come complete with plans for intensified militarization to respond to the post-cold war need for new enemies that both legitimate militarism and promote free trade as well as the idea of the state itself. Bush and Calderon are clear that, in the absence of the internal and external communist threat of the previous era, immigrants, drug cartels and youth gangs are joining “terrorists” in the mish mash of enemy-making in the post-Cold War politics of the hemisphere. For more on how this applies to immigrants in the U.S., see this recent piece. Those protesting the cheapening of their lives in the U.S. and Mexico are also joining the ranks of the unruly masses requiring enhanced legal and police control. Policing at protests like those of New Orleans preview and expand the closing of public space and rights by the true sovereign of our political and economic system: border-hopping big capital. Interestingly, those protesting the summit included both locals organizing a very important “People’s Summit”, some left-leaning Latin American solidarity organizations and right-leaning Lou Dobbs “pro-sovereignty” groups and individuals, many of whom are quite anti-immigrant. Also curious was how Bush introduced New Orleans Mayor Ray Nagin as “el alcalde” (Spanish words for “the mayor”). I remember being in New Orleans shortly after Katrina and hearing responses to Nagin’s statements about the need to “stop New Orleans from being overrun by Mexican workers.” I wonder what Nagin was thinking as he stood next to Bush and Calderon (see below) while they announced trade and military agreements that will foment further migration to New Orleans from Mexico? This week’s Latino Congreso taught me that, from Maywood, California to the Bronx and Cochabamba, Bolivia, brown people are drinking brown water. I also learned about the deepening wells of of elite fear beneath racist metaphors like “brown tide rising” used to describe the political ascent of Latinos across the continent. But what struck me most was how problems like the dirty brown water are giving rise to a political clarity and unified vision unprecedented in the annals of hemispheric history. Like the oceans and subterrenean waterways that have always united us beneath the surface, political agendas from the Canadian border to Patagonia are starting to flow from the same source: the pursuit of justice. I heard this from 22 year-old Latino Congreso delegate Karen Linares. After looking at a thick, rusted pipe and a bottle of brown water used as part of the presentation by a South LA activist on a panel about “Water Justice”, very smiley Salvadoran-Mexican college student Linares got a serious look about her. “The L.A. river water running by my house is full of filth. I saw the same brown water in El Salvador. In Tijuana you see the sewage trickling down the dirt roads.” Asked whether a and what, if any, connection existed between what she saw in her neighborhood and in her parent’s homelands the rather “shy” (ie; “You should talk to my friend cuz this is my first event and she knows more”) answered, “Clear water runs upward where the money runs. Brown water runs down where poor brown people are.” In listening to Linares’ “shy” brilliance one hears the political music of the spheres, the hemispheres being written. For the next few days, I’ll be in Los Angeles blogging from, speaking at the Latino Congreso. This 5-day convergence of Latino leaders and activists from across the US is an important new political expression of the Latino community, one that tilts to the left of the usual corporate, National Council of La Raza-like corporate & Pentagon-sponsored love fiestas that pass for Latino political gatherings these days. Check out the Congreso’s website and see for yourself a Latino event that (fasten your seat belts) actually talks about stuff like the environment, the Iraq war, criminal justice and US relations to América Latina (several ambassadors and other hemispheric actors will be there too) to name a few (yes, U.S., we do think about more than stealing jobs & hubcaps, marching madly and stuffing ourselves wild with tacos & Budweiser). Will try to be a digital fly on the wall and bring you interviews with some of the luminary and, yes, handsome (cuz we are) Latina(o)s and Latinoamericana(o)s I run across. I’ll also test rumors heard at the SETI (Search for Extraterrestrial Intelligence) project about the possibility of intelligent life in the Latino universe (“rumors” cuz the Roswell secret of our intelligence means no other media in the U.S. allows we aliens to think publicly). Much more to come on this breaking story. 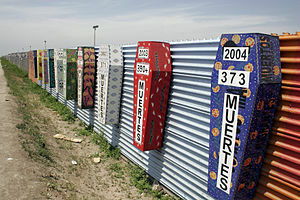 Chertoff’s remarks contradict studies and analyses of the environmental groups like the Sierra Club, which issued a report stating that the Bush Administration’s border wall will “put immigrants’ lives at risk, routing them deep into the arid deserts of Arizona where water is limited and a fragile ecosystem lives in a delicate balance” (also see this great report in the Texas Observer by my colleague Mary Jo McConhahay). 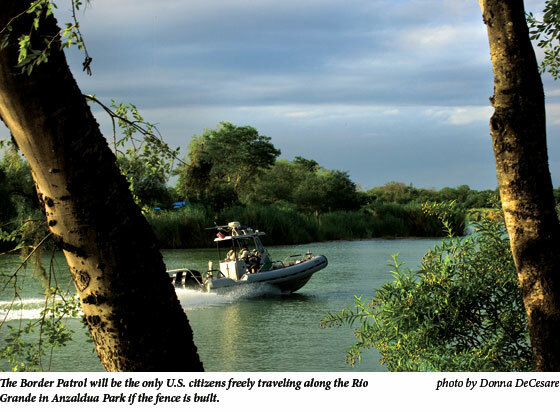 And last week, Rio Grande Valley Sierra Club chairman Jim Chapman told the Houston Chronicle, “The fence, even though it’s not continuous, is an unmitigated disaster for wildlife along the river”. Chertoff also made no mention of the reports and intense criticisms of the flaws and delays in the construction of the border fence by Boeing and other contractors who continue receiving multi-billion dollar payments on the project. These most recent statements blaming immigrants for environmental degradation are important in that they mark an institutionalization of themes and ideas long promulgated by some of the more radical elements of the anti-imimgrant right. Groups linked to anti-immigrant godfather John Tanton have, for many years, taken out radio and TV ads and issued reports blaming immigrants for major environmental problems. The Sierra Club itself was threatened with a takeover led by anti-immigrant activists with advanced degrees and considerable prestige. Though their Sierra Club coup failed, Tanton allies UCLA physicist Dr. Ben Zuckerman, and Stuart Hurlbert, a 2003 National Academy of Sciences award recipient and fellow of the prestigious American Association for the Advancement of Science, continue longstanding efforts to mainstream the most extreme anti-immigrant ideas about the environment. In addition to being another sign that immigrants are the political gift that keeps on giving to to political and economic elites stewarding the sinking ship of state, Chertoff’s unprecedented comments also signal the success of the environmental flank of the anti-immigrant movement. Ojo on this. Felix’s path covers lush, verdant lands dotted with volcanoes, almond trees – and a long, painful history of US military presence. As the impacts of the hurricane become clearer, watch how the men and women in fatigues become the heroes of the story, a mainstream media story that will likely lack any explanation about why, for example, almost half of the people living in Honduras live on less than $2 a day. Neither will they report on how “Joint Task Force Bravo” is staging rescue operations from the same military bases where they trained and housed the infamous Contras as these “freedom fighters” killed more than 30,000 mostly noncombatant poor people in their failed Cold War quest to overthrow the Sandinistas who are now back in power. One example of this type of multinational maritime exercise called TRADEWINDS which addresses transnational security threats in the Caribbean. Recent TRADEWINDS exercises have been crafted to provide Caribbean nations training for the security requirements they will have for the upcoming World Cricket Cup. This year, Belize hosted TRADEWINDS 2007 in which 16 countries enhanced their collective abilities of maritime and ground security forces to prepare for and respond to security threats. 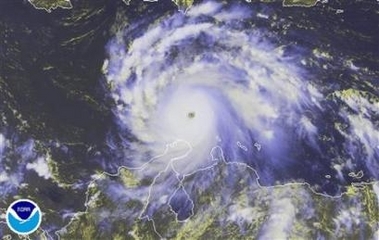 While the hurricane of US economic policies like CAFTA are the primary source of the region’s poverty and propensity to migrate (ie; about 80,000 Hondurans try to migrate annually), the volcano of militarism also does its part to displace – and silence- the poor, especially poor youth, as noted in this report from Amnesty International, which documents how the same Honduran military that was trained for rescue operations is also being trained in counterinsurgency strategy and tactics targeting those most likely to rebel against a $2-a-day future: youth. For a local perspective on the relationship between land, environment and militarism, see this excerpt from campesina leader and former refugee, Elvira Alvarado’s Don’t be Afraid Gringo. Though written during the height of the Central American wars of the 80’s and 90’s, it documents well how the elite “Gringos” saw powerful refugee women named Elvira and others as communist threats in need of a military solution. Hurricane felix provides another tragic object lesson about how, in the post-Cold War age of migration and other “national security threats”, hurricane survivors, environmetal refugees and other migrants named Elvira are now seen as requiring a military solution. Le Plus Ca Change… Le Plus C’est La Meme Chose.